A series of five free workshops aimed at jump-starting a citywide conversation about our city’s water challenges – and possible solutions. What has worked for these vanguard cities and how might those lessons apply to New Orleans? Moderated by Jeff Eger, executive director of the Water Environment Federation. Community conversation panel included: Councilmembers LaToya Cantrell, Cynthia Hedge-Morrell, Jackie Clarkson; David Waggonner, Principal at Waggonner & Ball Architects; Marcia St. Martin, Executive Director of the Sewerage & Water Board; Cedric Grant, Deputy Mayor; and Jeff Hebert, New Orleans Redevelopment Authority. Speakers included: Charlotte Kaiser, director of Innovative Finance for the Nature Conservancy; Brian Van Wye, branch chief of Stormwater Program Implementation for the District of Columbia’s Department of the Environment.Moderated by: Marco Cocito-Monoc, director of Regional Initiatives, Greater New Orleans Foundation. Water Management Strategies for the Greater New Orleans area – Click here for the Living with Water website (GNO, Inc. and Waggonner & Ball Architects). 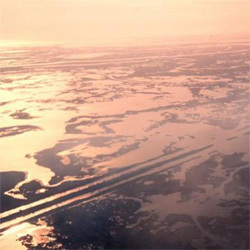 Feature image of a flooded road adjacent to the Venice Marina in 2010, courtesy of WWNO. Listen to The Louisiana Coast: Last Call here. In partnership with the Urban Institute and over 30 local partners, the Greater New Orleans Foundation is hosting The Urban Water Series: Strategies That Work. At the conclusion of the series, we’ll focus on lessons learned and what practices New Orleans may want to adopt from cities with similar experiences.